Website and other Digital Media applications can gather information on clients so that you may better serve them. And Marketing gets a little assist with demographics and other data on viewers and a helping hand with automatic emails, online event registrations, even a Calendar that's easy to access, easy to update. Find out where your information is going, how you can serve customers better, know who (and where) the new customers will be coming from. And have all this information delivered in a format you can really use, too. Need it in a spreadsheet? No problem. Database-format? No big deal. This is where your orgainzation needs to be. What is New Media? Well, it's the new term for all web media. Websites, Web TV, Blogs, Podcasting, and Digital Brochures are all New Media. More and more people are moving to the Internet to find information, learn, and be entertained. Once Web TV moves into more homes, you'll watch your favorite TV show, surf the web for info and make online purchases all from your living room couch. We know it's a lot to take your organization to the next cyber level, but that's where we come in. 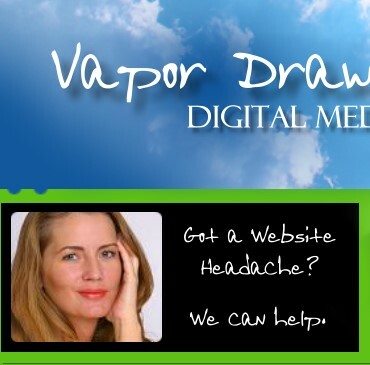 Let Vapor Drawings Digital Media get you up to light speed. Relax. You don't have to work so hard. Let your Website, Digital Brochures, Online Auctions, Podcasts, Blogs and other Digital Media, also called New Media, work hard for you. Beyond your website, there's a whole new array of products that can help you do your job. That way you can take the time you really need to for analyzing, brainstorming and creating. Some are for your viewers and can be plugged into your website like children's interactive games, or an online store. Some are for you so that you can get your message out and collect some back-end data. These are interactive multimedia files that look and act like a brochure. You can email them, post them to the web or play them for an audience, either on a big screen projection system or on a laptop computer at your convention booth. Recipients can interact with the brochure to influence it's mode of play to review information. They can contact you through an interactive form in the brochure, or they can quickly email it on to a list of friends or associates, spreading the word about your organization for you. Multimedia Promotions, Annual Reports, etc. Is your Board Meeting usually a Bored Meeting? Stun them (and spare them) when your next Annnual Report is a wonderful multimedia piece. We can even insert your digital or promotinoal video, so your presentation plays like a movie, but without the expense of a Video Production Company. Need to wow those potential donors? They'll really appreciate the way our Multimedia Promotions convey your need in an intelligent, respectful and entertaining way. No boring presentations here! And the same presentation on CD-Rom will play on a big screen projection system for a large audience or on a laptop computer at your convention booth. So your media does double duty. So much can be accomplished on a website or in a brochure with an Online Fundraising strategy, that we've got a whole new companydevoted to it. Click Here to discover the powerful products we've developed to get you donations and provide your development staff with donor and potential donor information.